Shown here is one of the last commissions that I worked on in 2013. 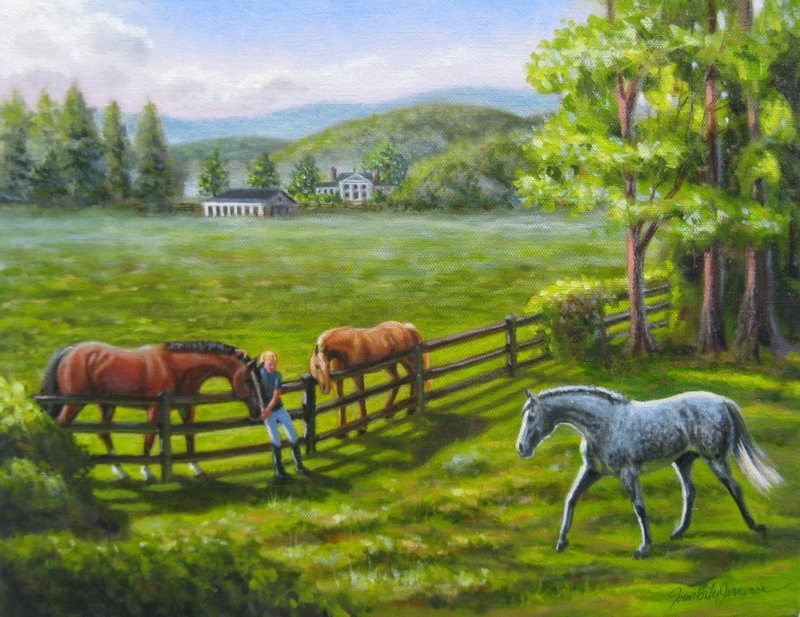 It is a painting for a lovely client that wanted nothing more than a painting that reflected the wonderful memories of her childhood growing up with horses. We talked and created an idea that would gather some of the images that were in her imagination. 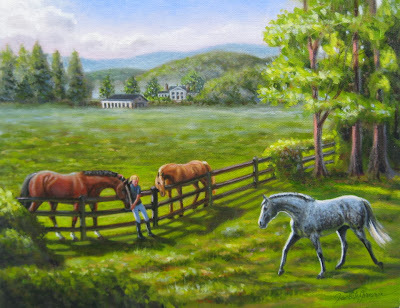 We worked on an idea for a pastoral view with a southwest Virginia feel to the landscape.... particular horses represented, a blond haired young girl and a homestead that looks like it could have been in the family for generations. This is the result and she was very happy. As my husband and I sat and watched the sunset on New Years Eve we made a list of all the good things about 2013. The list was long and full of so many events for which we are so thankful. It was like a Christmas letter to ourselves and we filed it away and decided that it should be a yearly tradition. Not a letter that we send out in cards, but just for our own memories so that we don't take for granted the wonderful times with family and friends. One thing that we noticed were the number of things that happened that we had not seen coming when the new year started in 2013......things that were such blessings in both our work and personal lives. There are challenges ahead in 2014 , no doubt......we will face them head on.... we hope to face them without forgetting that life is more good than bad. When our kids were growing up we joked about keeping our list of "happy thoughts"..... a list of moments in time that just make our blood pressure lower and our stresses melt away. I wish all of you reading this a long list of happy thoughts for 2014. Get started...right them down.... 2014 has left the starting gate!